Catharine Hydon is the Director and Principal Consultant at Hydon Consulting. A knowledgeable and engaging facilitator, Catharine draws on her experience working in a broad range of early childhood settings to provide innovative solutions and build capabilities. 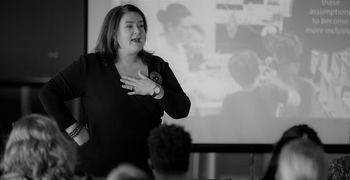 She draws on her work with educators, children and families and her master's studies to inspire those wishing to explore excellence in early childhood service provision. Best known as a strong advocate for professionalism, ethical practice and as a facilitator of pedagogical leadership, Catharine is available to assist organisations, individuals and communities to explore excellence in early childhood education and care. As a key note speaker, a facilitator of workshop and professional learning or as a coach and mentor Catharine will motivate and inspire.